It’s time to jump on board with the luckiest number in all the land. Click here to play! Have you guessed what it is yet? That’s right, it’s Lucky Sevens! The number everybody looks out for is ready to pay out exorbitant amounts of cash. Lucky Sevens is a lucrative 3-reel slot that is played over a single pay line; the more lines activated means you have a better chance for spinning up winning combinations! There are no distractions like Wilds, Scatters, or Bonus Rounds, just sheer winning! The old favorites like Cherries and Bars will help you win plenty of cash, but if you are on the hunt for the biggest prizes, then try spinning up all three Green Sevens on the active pay line for up to 2,400 times your original bet. 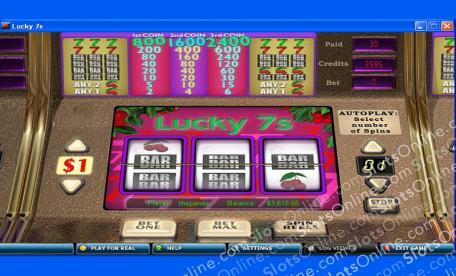 Start playing and winning at the luckiest slot around: Lucky Sevens!